How does your school schedule work exactly? This module thing is kind of confusing. 1. Acupuncture classes. These happen at our classroom at Rose City Park United Methodist Church. Each student cohort meets for 4 days a month, 10 months of the year, for three years. The modules take place Saturday through Tuesday, 9 am to 5 pm, so you will spend 28 hours a month in class or 280 hours a year, for three years. So for example, Cohort 1 meets from the first Saturday of the month through the following Tuesday, Cohort 2 meets from the second Saturday of the month through the following Tuesday, etc. We’re on break for the month of January and the month of August. 2. Biomedical co-requisite classes. 420 hours of science. Many students take these before applying to POCA Tech; others take them concurrently during the first two years. You can take these at any accredited institution, including online. 3. Clinical training, which is comprised of 160 hours of Observation in the first/second year, and 500 hours of Clinical Internship during the second/third year. This training is individually scheduled. At this time you must plan to move to Portland OR in order to do your clinical internship for at least 1 1/2 years. Exactly how long your clinical training takes will depend on a variety of factors, including your availability and the availability of clinic shifts. Do people work at the same time as going to school? Yes, almost all students do. The POCA Tech program is designed to allow people to keep working by condensing class time into four days a month and keeping the class schedule consistent over three years. That said, it’s VERY demanding to balance work, class time, homework, co-requisities, and clinical training. Is this a 3 or a 4 year program? The POCA Tech program is designed to be done in 3 years but you can take as long as 6. It all depends on how you balance the demands of completing the classroom work, the co-requisites and your clinical training with the demands of your life. Can I transfer to POCA Tech from another acupuncture school? No. All students have to start at the beginning of the program. POCA Tech cannot offer transfer credits for any acupuncture school classes except biomedical classes, provided that the acupuncture school was accredited. Why do POCA acupuncturists call themselves punks? 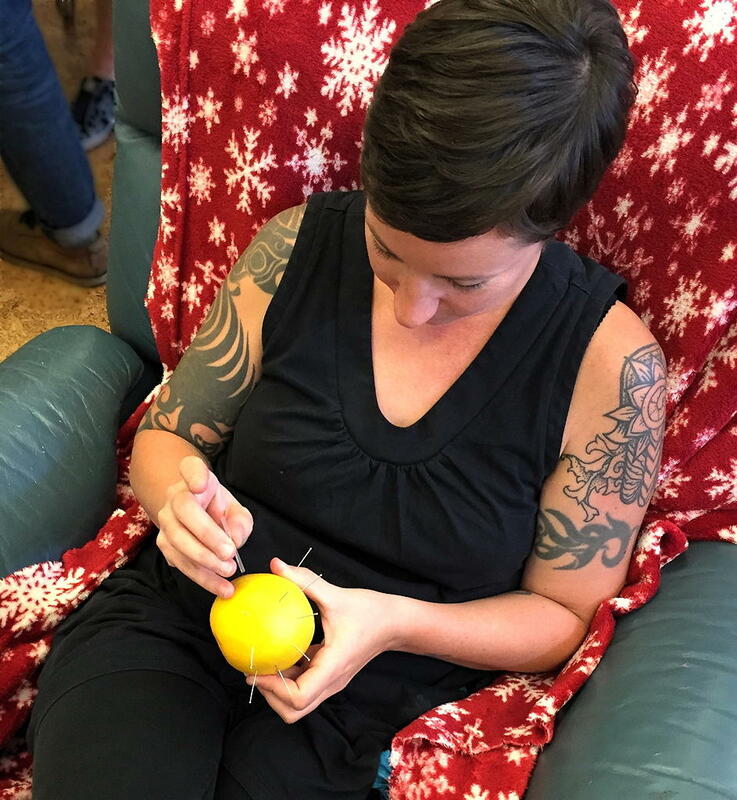 Community acupuncture – as practiced by self-styled ‘acupunks’ – is a radically different vision and philosophy for the practice of acupuncture in the West. Patients are seen in a group setting, which allows for treatment to be conducted via a high-volume, low-cost sustainable business model. Spa settings and excessive Chinese medicine theory are unnecessary with such a model of treatment, as the needles do all the necessary work. This article describes the vision, aims and underlying philosophy of the community acupuncture movement. The long answer is in our free ebook: Punking: the Praxis of Community Acupuncture. Will there be other campuses of POCA Tech at some point? We hope so. And that's all we have to say about it right now. Now that POCA Tech is accredited, will you be offering a Master’s degree instead of a certificate? No. We offer a certificate rather than a degree for philosophical reasons, and our philosophy hasn’t changed. Now that POCA Tech is accredited, will you be offering federal financial aid? No. POCA Tech has a commitment to try to keep program costs under $25,000, and oddly enough, offering federal financial aid would torpedo that plan. Significant administrative infrastructure is required to offer federal financial aid, and we’ve been advised by knowledgeable people that getting into the business of student loans could cause our tuition to double. So far, a number of POCA Tech students have managed to get through school with a combination of saving and working and payment plans in the vicinity of $500 a month; doubling our tuition would put an end to all that and require the majority of students to take out loans to go to POCA Tech. It’s similar to the reason that the community acupuncture model is designed to run without insurance billing; once you get a third party involved, everything gets much more expensive, and you also end up dependent on that third party. In an effort to save people money, you can end up charging them more and sacrificing your own independence. What form of acupuncture do you teach? TCM, Classical, other? The purpose of our program is to teach students to handle a high volume of patients. There are a lot of people out there who need acupuncture; people are literally dying for lack of access to non-pharmaceutical pain management. There’s no one right way to do acupuncture, and one of the most important attributes for a practitioner in a high volume setting is flexibility. Therefore, what we teach is 10 different approaches to acupuncture: auricular, scalp, Miriam Lee’s Great 10, Eight Extraordinaries, Jingei, Balance Method, Master Tung, Dr. Tan’s 12 Magic, Korean 4-Point, and TCM. We want our graduates to cultivate flexibility and to have a range of options. What is the curriculum and course work? How many/which days/hrs a week are dedicated to class time, so that I know how much time I will have to put toward making a living in tandem? Please see the catalog, this is all in there. I really like the concept of community acupuncture, but come on, isn’t private room acupuncture actually better/more effective/more appropriate for complex problems? There is no research that shows any type of acupuncture is better than any other type, either in general, or for certain types of problems. What research there is on acupuncture efficacy suggests that the most important factor is frequency of treatment. Some individuals may prefer to receive private room acupuncture; some individuals may prefer to receive community acupuncture; some individuals may get better results from specific kinds of acupuncture treatment (local, distal, long needle retention, short needle retention). Humans are very diverse, and there’s a big range of possible responses to acupuncture, from “no thanks” to “meh” to “utterly life changing”. This is true no matter what style of acupuncture you use. There are things you can’t provide in private room acupuncture that you can provide in community acupuncture, and vice versa. However, if you truly believe that community acupuncture is an inferior/reductive version of private room acupuncture, do not apply to POCA Tech; you will not be able to learn what this program is designed to teach. Will I be able to treat all people regardless of income in a private clinic space meant for seeing 1 client at a time? See above: this program isn't for students who want to treat in private settings, and in our experience, no, you can't treat a large number of people sustainably, regardless of income, in a private setting. This is a major reason why we developed the community acupuncture model. If what you want is to treat one person at a time, please, please, please do NOT apply to POCA Tech. You will be unhappy and so will we! There are more than fifty other acupuncture schools out there, that want nothing more than to teach you how to treat one person at a time. Please go to one of them. I am unclear if after study, I will have earned a Masters of Acupuncture or a Certificate and what the difference is if it is only a certificate. How will I introduce myself— L. Ac.? MSAC? MSTOM? Other? Graduates of POCA Tech earn a Master’s Certificate in Acupuncture, which for all intents and purposes, as far as we know, is equivalent to a Master’s Degree in Acupuncture because it meets the same ACAOM standards. If you meet all the requirements for state licensure -- one of which, in most states, is to have attended an ACAOM-approved school -- once you get your license, you can introduce yourself as an L.Ac. Of course, since our program was designed and built and funded by people who call themselves POCA punks, we hope you’ll want to call yourself a punk. What do you mean by prerequisites for the POCA Tech program? Before enrolling in POCA Tech, applicants must have completed at least 2 years (or 90-quarter credits or 60-semester credits) at an institution(s) of higher education accredited by a federally recognized accrediting agency. These are usually undergraduate college courses and/or an AA degree, but a degree is not required: only enough hours/credits. This is also referred to as the basic education requirement. These classes may be in any subject. If you are still completing your prerequisites and have a choice about what to take, we recommend classes in biology, psychology, behavioral health, statistics, and business management. Basic classes in writing and bookkeeping are also helpful. I don’t understand the science co-requisites. Please explain more. ACAOM-approved acupuncture programs must include a certain amount of science (450 hours). 35 of the hours in POCA Tech’s module classes fit this criterion; we ask students to get their remaining 420 hours elsewhere. IF students enter the program with MORE than the basic education requirement (pre-requisite of 2 years higher education), some of these prior classes may potentially qualify towards the science co-requisite requirement. Pre-requisites (the basic 2 years of higher education) cannot be counted towards science co-requisites, if that makes sense. However, if you have more than 2 years of higher education -- say, a BA degree in a science such as biology, sociology, or anthropology -- some of those classes could potentially count towards the co-requisites. Must co-requisites be taken at an accredited program? How about online classes? Yes, co-requisites can only be accepted if they were taken at an accredited program. Online classes are fine, as long as the institution offering them was accredited. Are there certain science co-requisites that POCA Tech requires? Yes! We require that students complete Anatomy and Physiology 1 & 2 and Medical Terminology. A class in Pathophysiology is recommended but not currently required. Other than those requirements, what science classes can be counted towards the co-requisite requirements? Because of POCA Tech’s program focus in Liberation Acupuncture -- socially engaged and socially relevant acupuncture -- we accept social science classes that are relevant to our program as well as “hard” science classes. Acceptable co-requisite classes include, but are not necessarily limited to: biology, chemistry, psychology, sociology, anthropology, behavioral health, statistics, gender and sexuality studies, social work, and subsets of these disciplines. We are looking for classes which will help support critical thinking and understanding of research. Please consult the registrar if you have specific questions about classes which might qualify for the co-requisite science requirement. 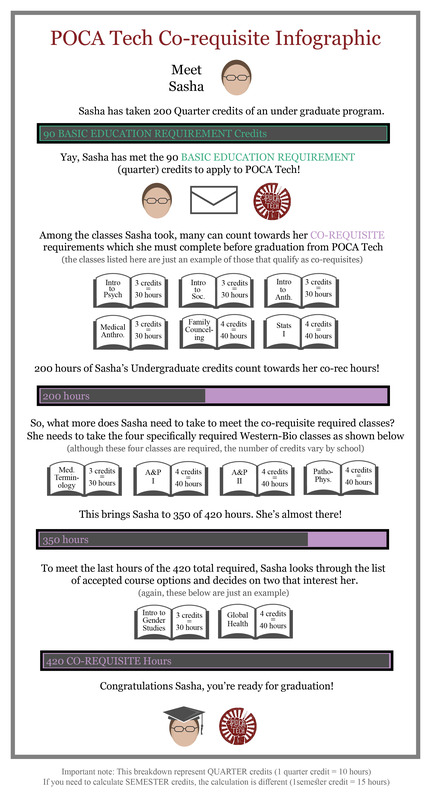 I’m thinking of getting the co-requisites done first before applying to POCA Tech just so I have more time. Is that OK? YES. We enthusiastically encourage this, especially if you’re planning to try to work a significant number of hours while in school. This will make your life much easier. What’s the Away Clinics project? It’s a pilot project that’s under review by ACAOM. On a limited basis, POCA Tech is being permitted to offer a portion of clinical internship at qualifying POCA clinics outside of Portland OR. Where are those Away Clinics? We have the green light for two Away Clinics: Providence Community Acupuncture in Providence, RI and Wasatch Community Acupuncture in Salt Lake City, UT. We expect to begin clinical internship training for approved students at both these clinics in 2019. Wow, that’s great, when can we add more locations? When we demonstrate that the pilot locations comply with ACAOM requirements and ACAOM approves us to expand. We have to see how the project goes in RI and UT first. We would love to add more locations when the time is right and more clinics are ready. I’m a prospective student and I want to do this! I can find clinical preceptors in my home state! Unfortunately, that’s not how it works with acupuncture education. Students can’t go out and find their own preceptors by themselves; there’s a significant process involved. First, POCA Tech has to get an educational license in the state in question. Second, there has to be a qualifying acupuncturist (at least 5 years’ experience) available, who is also willing to come to Portland to be trained as a supervisor. Third, the clinic -- which must be a member clinic of the POCA Cooperative -- has to apply and be approved by POCA Tech as an internship site. And finally, ACAOM will have to approve any expansion of the pilot project beyond RI and UT. We post announcements about Away Clinics on the POCA forums, in this designated thread. If anything significant happens, we promise we’ll post something there right away. But at this point there is nothing anybody can do, not even sending us emails every 10 minutes, to make things go any faster. Please keep an eye on that forum thread. We’re a small school with a small staff and when prospective students keep themselves informed by reading the forums, it saves us a lot of time. And if you have follow up questions about this FAQ, please post them there! Thanks.